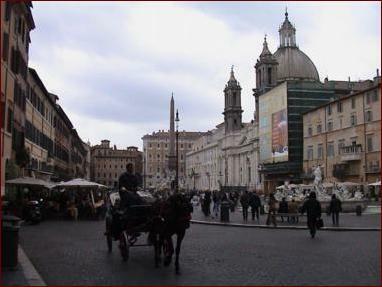 Piazza Navona and the Campo dé Fiori are neighboring areas, separated by the busy Corso Vittorio Emanuele II. The piazza was built on the foundations of Domitian's Circus (81-96 AD), the largest in ancient Rome, larger than the Colosseo (Coliseum), able to seat 50,000 spectators. Called the "Circus Agonalis" (competition arena), the name became corrupted to "n'Agona", and eventually "Navona". 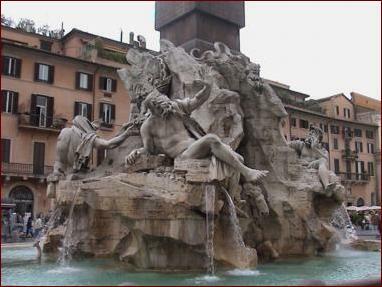 A baroque jewel of masterpieces, the Piazza Navona contains Giovanni Lorenzo Bernini's [1598-1680] Fontana dei Quattro Fiumi (Fountain of the Four Rivers) and Fontana del Moro (Fountain of the Moor), Calderari's Fontana del Nettuno (Fountain of Neptune), and Francesco Borromini [1599-1667] (the Church of Sant Agnese in Agone). The fountains are fed by the Aqua Virgo aqueduct. 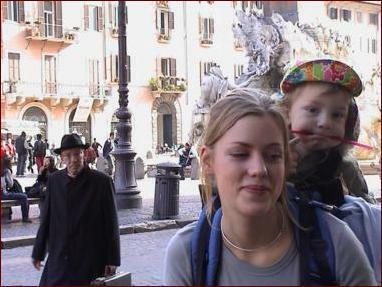 The picture above is of the Fontana dei Quattro Fiumi. In the center is an obelisk from the Circus Maxentius, erected over a rocky grotto, from which a lion and a horse emerge. The four figures represent the main rivers of the four continents known at that time: the Danube, the River Plate, the Ganges, and the Nile (which appears with a veiled head to indicate that its source was still unknown at that time). We missed the Christmas fair which fills the piazza in December, but we did enjoy both day and night art and performance fairs during our stay. Painters and artisans offer their work, even in the rain. We passed on getting a caricature done. Tre Scalini, famous for its Tartufo (truffle) ice cream, was closed for renovation, so we couldn't indulge in the Tartufo con Panna, to which we'd been recommended.